SPARK Movement is an intergenerational activist coalition of people and partner organizations working to ignite a girl-fueled antiracist gender justice movement. We’re a place you can find other girl activists, as well as resources, and information designed to support an online and on-the-ground global young feminist movement. It means adults and girls work together as partners, but girls take the lead. In other words, when you identify injustices and problems you want to fix, adults are there to offer you the tools and support you need to fix them. And in terms of our intersectional feminism, we love EverydayFeminism.com’s definition: “Feminism strives to end the discrimination, exploitation, and oppression of people due to their gender, sexual orientation, race, class, and other differences and supports people in being free to determine their own lives for themselves.” We absolutely reject any definitions of feminism that exclude the experiences of people of color. Is this the same SPARK Movement that challenged Seventeen, LEGO, and Google? Yes, that’s us! We’ve done some amazing things. We called out LEGO for the ways their toys stereotype girls. They invited us to meet with their marketing and design team and we presented them with a full “gender audit” of their company and offered ideas for how they could improve. One year later, LEGO launched a new line of female scientists. Our campaign demanding Seventeen Magazine publish “un-Photoshopped” photos of girls and commit to body size and racial diversity led the magazine to publish a “Body Peace Treaty” promising just that. After our research revealed shocking gender and race imbalance in Google’s homepage “Doodles,” Google publicly committed to work toward diversity. They invited us to partner with them to create and launch a cellphone app to map women’s history globally. We’ve also run campaigns that challenge racism and sexism in the media, offer free tools for sexual violence prevention, and protest sizism in the clothing industry, racism in the beauty industry, and sexualized toys and products aimed at girls. How has SPARK changed? And why? We used to work just with a small SPARKteam of girls to do actions, but we suddenly realized we could reach so many more girls if we just shared what we’ve learned and worked with our friends to get the word out. Activism requires coalition and we’ve built a great one. Tell me more about this new coalition of friends and how you work together? SPARK is now a group of partner organizations all working toward the same thing—a girl-fueled anti-racist, gender justice movement! We’re sharing our skills and resources to get this done! Tell me more about your partners, please? SPARKaction: About-Face, a girl-fueled media activism site, oversees the SPARK Action Squad (SAS), a diverse girl-led squad of over 400 young activists (and growing) engaged in both local and global action campaigns, conversations, and projects aimed at combatting gender injustice. SPARKresearch: Each successful campaign has required us to “do our homework” to be sure what we think is a problem is really a problem. Then we use that research to figure out creative solutions. The SexGenLab@CUNY keeps us up-to-date on the latest research and develops action projects grounded in girls’ questions and experiences. SPARKtraining: We’re developing curricular activities, toolkits, activism workshops, videos, and presentations you can access for free to support your actions. And we’re available to help you get your intergenerational activist campaigns off the ground! SPARKtheater: We love the power of girl-written and performed theater projects. 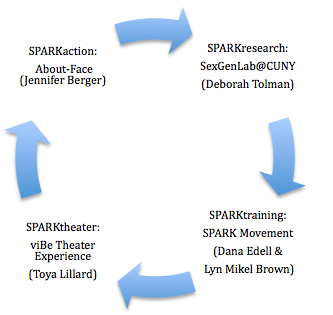 viBe Theater Experience, a girls’ performing arts organization that produces original theater with girls of color in New York City, will create, produce and facilitate an annual SPARK activist performance event. How can I get involved with SPARK? How can SPARK support my activism? Join the fierce, funny, and fabulous SPARK Action Squad! Co-led by a team of girl leaders the Squad pitches monthly actions for girls to do online or locally, provides a private online forum to discuss issues related to feminism and activism, hosts movie nights and book clubs and fosters a community of young feminists. And check out “for girls” on our homepage to find free resources, information, and tools you can use in your activism work.